Caterham Super 7- What do Steve Tyler and Joe Perry of Aerosmith, country singer Alan Jackson and Riverdance's Michael Flatley have in common? For $8000.00 you could have one, too. For all intents and purposes a Lotus 7, the Caterham is sold in the UK as a complete car. Here in the US it needs to be sold as a kit. (Which is how may of the original Lotus 7 cars were sold anyway). This car has a Toyota 4A-G engine in it. Most likely it's the 16 valve version. It's a good engine that it perfect for a car like this. The fuel injection is gone, replace by a pair of Dell'Ortos. There has to be some sort of official "fun for the dollar" quotient out there, but I don't know what it is. I do know that this car would rank very high on the list. Located in Chapel Hill, NC, click here to see the Craigslist ad. I saw this car and that song popped into my head, where I'm pretty certain it will stay all day. Look at this thing... It takes up the whole driveway. You could have the front bumper in one garage and the rear in the one across from it. This is not a car I would ever want to own or drive, but it's amusing to look at. 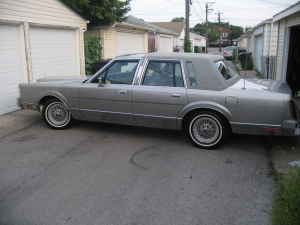 Located in Chicago, IL, click here to see the Craigslist ad. Nissan 300ZX Convertible - This is most likely a Straman Convertible. Richard Stramen has made some pretty interesting convertibles over the years. He's worked on everything from Ferraris to Honda CRXs. This is a terrible ad with just 2 pictures and very little text (the year of the car isn't even included), but it's an interesting car. 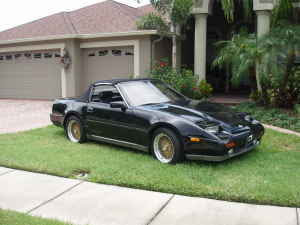 Located in Tampa, FL, click here to see the Craigslist ad. As someone who used to drive an '84 Town Car back in the day 10 or so years ago (I didn't choose the vehicle myself, believe me) it isn't a car you want to own or drive! It was like driving a barge and the fact that eventually there were times that it would die soon after it started up (and eventually wouldn't start at all) so maybe that has colored my opinion. Still, in hindsight I wouldn't have minded driving something like a Peugeot or a Renault instead. Still, I didn't have the Cartier Edition and I'm sure it was great for the time and for some people it's perfect for them. I remember my dad getting the Town Cars as a rental when business visitors were in town. In the eyes of a kid, the digital radio and huge interior were super cool. Now, I don't think I'd have anything to do with them, but I still turn my head when I see one. $8000. Caterham must be "wrong" somewhere, or does the great Toyota engine devalue it somehow? 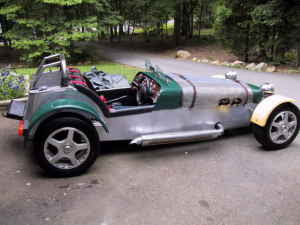 Five years ago I got twice that much for a DSK (American built Lotus 7 clone)that I assembled with a Mazda 13b. Recently heard from the purchaser and he is still quite pleased with his car too! While I would certainly choose having one of these over having a Kawazuki "superbike," it would serve the same purpose. Not my favorite year. I like the late 1970's models with the upright grille, and the newer post 1990's models. Of course, this means weeding out models with opera windows and "gold packages," but in the end you will have the last of the dinosaurs. My take is that there will be nothing on the road remotely like a Town Car in about 20 years or so. I'd deck it out with some Tangband speakers from Part Express, and an audio player of some sort, and use it just to listen to loud music and cruise around. Finding a place to park it in the winter might prove problematic as it could engulf an entire garage. You can still find lots of previously garaged sub 60K example on ebay (and elsewhere) for dirt cheap. If you get sick of having it around, it would be a perfect first car for a teenager. The overstuffed double pillow velour recliner seats in these vehicles are worth the price of admission alone. Far too much Knight Rider for my tastes.